I absolutely love the design of my beautiful closet, I can't stop going in there! Everything really is in its place, and my morning routine has become so calm now that I can see and find what I need. My jewelry drawers, laundry bins, and ironing board are my new favorite toys. Thank you! I just want to thank you for my beautiful new closets. My friends are so impressed with how great they look and I am so happy to be able to find things. Putting away laundry is now so easy, especially for the kids. Your workers were really great and so professional. The whole process was a joy and the results are fantastic. Many thanks! I have the best looking pantry of anyone I know and I have you to thank! My husband is happy because I am more inspired in my cooking recently. It's because I love my new pantry! Thanks for a top-notch job. I just have to tell you that I love my new pantry so much! I can see everything and after all these years, my kitchen is organized. I'm a believer. Thank you. Donna helped me with draperies, furniture placement, shutters and did our master closet! She was always on time, professional and very personable! I will hire her again and would recommend her highly! Our closets were late 1960s style with wooden boards above a steel rod - not very efficient. Now that the master closet and kitchen pantry have new 'insides' we have more than enough storage space. Donna is very easy to work with and a creative problem solver. Love my new closets! In Its Place Design was great to work with. They listened to my needs and accomplished exactly what I was looking for in a short period of time. They were able to work within my budget and provide solutions for things that I had not have even thought of. Originally they organized my garage and I have truly loved it! I later had them come back and do my laundry room which is so functional now. Next on the list are closets and kitchen pantry and I will definitely have them back to complete those projects for me as well. Donna did a fantastic job of coming up with a workable solution for our master closet. We went through various scenarios and decided on what would be best for our needs. Donna was a pleasure to deal with!!! She was very respectful of our needs, and her installation team left the space they used clean upon completion of installation. Donna clearly spends much time coming up with solutions for the particular space, then works with the client to determine what will be best. I would give Donna and In Its Place the highest recommendation. "I LOVED my closet install with Donna from "In Its Place Design." Not only did the closets and garage storage system exceed my expectations, but I was so impressed with how fast everything came together. I met Donna at the Home and Garden show in Birmingham. The following week she was in my house taking measurements, the next week a design was in my email box, then within a couple weeks she was installing new shelving with her crew. They did the demolition of old closet shelving, patched holes, installed new closets and Donna spent a couple hours helping me organize my stuff in the new system. Donna was a joy to work with. She loves her job and it shows. Her pricing was the best I had found and her customer service is exceptional." I really wanted custom closets in my new home in Chelsea Park, but the quotes I got were just too high. From the moment Donna came to see me, I felt like she listened to what I really needed and what was most important. The designs we settled on are perfect. I love that I can add to the kids’ closets later as our needs change. My master is just perfect, fully custom, and was affordable. The solutions Donna came up with for the pantry and laundry are just perfect! I loved working with In Its Place and I recommend them highly. Once the kids got back into school, Donna and I tackled reorganizing many areas of my home, beginning with the pantry. Then we did the master closet and my office, and are about to start on the dreaded garage. Donna is a joy to work with, such a special person, and I am so thankful her wisdom and skills. My home is more organized than it’s ever been, and I love it! Call Donna and let her come help you get it all under control! I love my new pantry the most! Also my garage and master closets look so clean and tidy, but my new pantry is the best. Donna had the idea to paint the walls grey to coordinate with my new kitchen, and it really pops with the white shelves. I’m super pleased with the design and the workmanship from In Its Place. My sweet husband bought me the best anniversary gift ever – a custom master closet! Donna at In Its Place designed her heart out until it was just right. I was surprised how fast it all got installed, and it’s just perfect! I’m pretty sure it’s cleaner now than when they started. I will be calling Donna back to do the pantry and maybe the garage. All I can say is have In Its Place come fix your laundry room so it functions! They did a super job on mine! I have always wanted my master closet to look just as it does now. Donna and her crew did a fantastic job of turning my stuffed, messy, frustrating closet into a neat, organized space that functions for me. I am so grateful. We had some built-ins in one of our closets and wanted more shelving and baskets for them. Donna found the products that match and the redesign is super functional and looks great too. Our pantry is so small and I really didn’t know what could be done with it, but Donna came up with great ideas and I can fit a lot more in there now, and I can find everything. Top notch! We chose In Its Place to do all the closets in our new home and we are very pleased with the results. Everything was installed perfectly and the designs really do suit our lifestyle. I recommend In Its Place to my friends. I wanted a custom closet to utilize all the space in our odd-shaped master closet. I couldn’t have dreamed of all the space I can now use, and how pretty it all looks. I couldn’t be happier with the work that In Its Place did in my home and I highly recommend them! If I had known how much I would love my closet, I would have done it sooner! Donna had great ideas and the finished closet is so beautiful and unique to my taste. I love the bling on the handles, and the mirrors and especially my glass shoe shelves! My closet is the envy of my friends. I’m sending them to Donna. I used to have the worst garage imaginable. We hadn’t parked a car in there in years! Now everything is up off the floor, and organized. I never would have guessed how much I needed to throw away, and how much would fit in there along with my car. So pleased with the work In Its Place did for me. I recommend them! We had our whole house of closets installed by In Its Place before moving into our new home. Donna met with us several times and was so thorough. When we moved into our new home, there was actually a place for everything, just like Donna said there would be. The designs we chose are really working well for us. I recommend them highly! We needed a solution for our narrow, long laundry room. I had no place to fold clothes, and with three kids we do a lot of laundry! 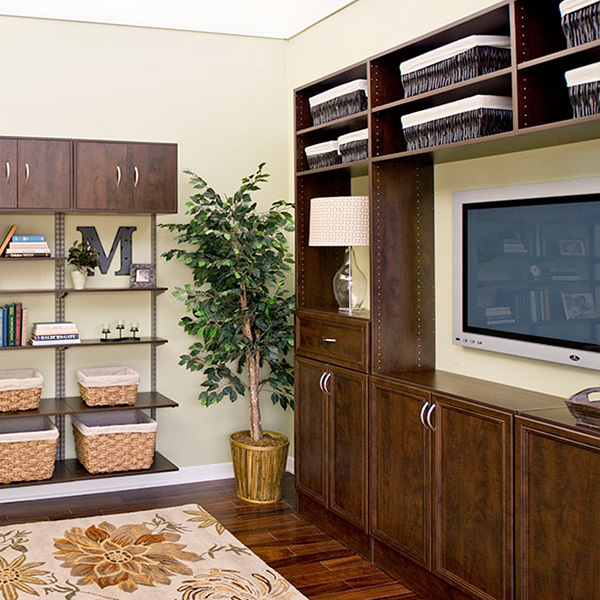 Donna designed a custom cabinet/shelving solution with a fold-down table that folds back up out of the way. She even thought of rounding the corners in case a stray kiddo came running by. This solution is so functional for me and has changed a dreaded chore to one that’s a little less daunting. We are blessed to have large closets throughout our home – except in the one place it matters – the pantry. I really struggled to get everything in there, and to stay in there! Donna designed a creative solution with pull-out trays that allows me to use all the space, and still be able to find things. I just love it. I highly recommend In Its Place. Our lake house has very small closets, and we like to stay there for most of the summer. We had a real storage problem! Donna designed closets for the master and kids bedrooms, and also the pantry, and some shelving in the summer kitchen. Everything is working really well for us and we are able to keep more things here, but out of the way! I will use In Its Place again for future projects. We upgraded our wire closet shelving for custom wood shelving and are so glad we did. Donna told us the only thing she does with wire is rip it out! We love our shelves that things don’t fall through, and they’re easy to keep clean in the pantry. I recommend In It’s Place because they did a great job for us! Top notch job on our pantry and master closet. Installers were very polite and cleaned up everything. We like the way everything is organized now. Highly recommended. I had a wonderful experience with Donna from In Its Place. I had her to come in for my garage because it was such a mess, and she ended up working on the garage, and also the pantry, laundry and my sewing room. She was so good I had to have her do the whole house. Having everything organized is a real help to me and I will be referring Donna to my friends for the great job she did for me. I did not know how much junk was in our house and now it’s all out and we can find things. My husband is very happy to have his garage back. In It’s Place did a really great job of taking out all the stuff, putting up shelving, and reorganizing everything. We are just so pleased.